The Highest Quality Tree Trimming and Removal Company in San Diego. Contact the Licensed, Insured and BBB A+ Rated Poway Tree Service, Estates Tree Service. Estates Tree Services provides homeowners, Homeowners associations, and businesses throughout Poway and the surrounding areas with the highest quality tree services, care, and removal at affordable rates. Call Today for a free quote on any of the tree services that we offer. Poway Tree Trimming, Tree Pruning, & Tree Lacing. 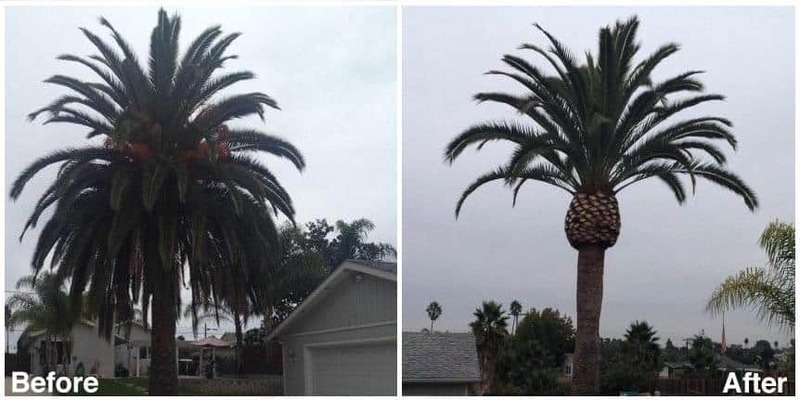 Poway Palm Tree Trimming, Thinning & Crown Reduction/Raising. Tree Crown Reduction, Crown Raising, and Crown Thinning in Poway. Poway Tree & Stump Removal. Commercial Tree Trimming & Removal in Poway. The experts at Estates Tree Service bring decades of experience to every job, no matter the size. We apply the industries best practices for tree care, maintenance, and removal. Our highly experienced, fully trained, expert staff of tree care experts has the knowledge and skill to care for all types of trees popular in the Poway region. By pruning each tree at the right time and in the correct way, we’re able to provide our customers with beautiful and healthy trees, which is important because a healthy tree is a safe tree, protecting and preserving your property is our priority. At Estates Tree Service, we can also have the equipment and capabilities to safely and efficiently remove trees, limbs, and stumps of any size. Whether you want to remove all of the trees from a new property or you want to remove a large tree branch that is leaning over a structure or even solar panels, we are prepared to handle tree service jobs of any size in Poway, Ca. When you call Estates Tree Service we will schedule an on-site and 100% free, no-obligation, written estimate for our services. No matter what size job or the exact service, we provide a customer satisfaction guarantee. Every on-site consultation is performed by the owner, Tom, who has been working in the tree industry for decades, he will work with you to develop a plan based on your needs and desires, He will also provide advice to help you develop a plan to make your property the best it can be. 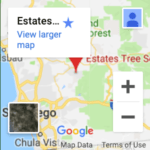 Your detailed written estimate will be custom built to fit your budget and Estates Tree Services will provide the high-quality service that you’re looking for at your Poway property. Call Us today at (760) 440-9138 for high-quality, competitively priced tree trimming, removal, and care prices in Poway or surrounding areas. We serve all of San Diego County and we offer 24/7 emergency tree service. We have built a reputation for being a dependable, trustworthy, and high-quality tree service because we treat each client with the respect and service that they deserve, our BBB A+ rating and hundreds of positive reviews on sites like Yelp, Home Advisor, Angie’s list are from real customers who have hired Estates Tree Service. We are licensed and insured which is the most important factor in choosing a contractor no matter what the industry is, our insurance protects not only our employees but you as the property owner as well. When Estates Tree Service works at your property you will find that we leave it in better condition than before we started, and your property will look much better with healthier and happier trees. Tree Trimming should always be performed by a knowledgeable, trained, and insured tree service company. Without a knowledgeable Poway Tree Service company your tree trimming could be doing more harm to your trees than good, we have seen many cases in which inexperienced tree trimmers leave trees with scars, cracks, and wounds, this damage makes the tree prone to infection and death. If trees are trimmed at the wrong time, in the wrong place, or have too much cut off it can lead to decay, sunburn and increased probability of becoming diseased. To ensure that your trees remain happy and healthy for years to come hiring the right Poway tree trimming company is imperative. We provide exceptional tree trimming, pruning and lacing services at very affordable and competitive pricing. Our staffs decades of experience, ongoing training, and familiarity with the industries best practices has prepared Estates Tree Service for servicing a wide variety of tree varieties including Palm trees, olive trees, eucalyptus, and oaks. Since 1992 we have served residents and businesses in Poway with the best Tree Service, Tree Removal, and Tree Trimming. We have hundreds of happy clients throughout Poway and San Diego County which has led to our great ratings on review sites such as Yelp, Home Advisor, and Google. We never consider a job complete until our customers are 100% satisfied. Our tree trimming, pruning and lacing services will not only improve the looks of your trees but the overall health of your trees as well and enhance the curb appeal of your property. Another benefit of our services is improving the safety and reducing the risks from unhealthy trees. When our crew arrives on site we will prepare the area to ensure nothing can be damaged, once services are complete we will restore the property to its previous state, leaving it better looking than ever before. Call us today for a free on-site estimate. Palm Tree Trimming, Thinning and Crown Reduction in Poway, Ca. Estates Tree Service is experienced in all varieties of trees, in San Diego, California and Poway specifically Palm Trees are very prevalent, unfortunately, palm trees require servicing in order to stay healthy and looking good. Our team of highly trained and experienced tree care professionals is excellent at trimming palm trees, which encourages growth and improves their appearance. Since we have been providing Poway Tree Service to residents and businesses since 1992, Estates Tree Service has become the experts at Palm Tree Trimming, Care, Crown Reduction, Skinning, and maintenance. We have trimmed all types of palm trees, date palms, California palms, Washington palms, pygmy palms and queen palms. Because palm trees are valuable assets to your property and they increase curb appeal to both homes and businesses you’ll need to keep them well trimmed in order to ensure they are happy and healthy. Not only does a healthy, properly trimmed palm tree look great, it is safer for your property, family, and guests. Dead palm frond and seed pods have been known to fall off during storms or when overgrown, causing damage or in many cases even injury. Prevent property damage and more by hiring the best Poway tree service company, Estates Tree Service. We can also provide palm tree skinning services giving them the iconic look that people expect when looking at a palm tree, this service must be performed by experienced professionals like the team at Estates Tree Service. When skinning a palm tree the possibility of damage which can lead to damage or death is high, but, when you hire a licensed, insured, BBB A+ rated team of Poway Palm Tree Skinning experts you will find that this service will leave your palm trees looking amazing! Stump and Tree Removal Services in Poway. Emergency, Hazardous and Unwanted Tree Removal. While having the best climate of any area in the United States or the world for that matter, San Diego and Poway are still prone to extreme weather conditions like Santa Ana winds, Microbursts, Heavy Rain, Hail, and fire, which is why our crew is available 24/7 for emergency tree service, removal and more in Poway. Often times residents of Poway move into a new home and find that it has a tree that they do not want, whether it is causing a hazard to a structure or just an eyesore, it needs to be removed. Our Tree removal and stump removal services will leave your property looking better, reduce droppings from the trees, and increase the usability and safety of your property. Our crew has removed thousands of trees, stumps, and branches since 1992, our high-quality work, BBB A+ rating and satisfaction guarantee mean that you’ll have the best-looking property in Poway at affordable rates. Depending on the size of your tree or stump, our work may take a few hours or a few days. Regardless, once we are done, we will leave your property debris free and looking great, disposing and hauling your trees, branches, and stumps. We can also chop your trees for firewood, chip the wood for mulch, or bring it to a green waste recycler to be made into a green product and help the environment. Give Estates Tree Service a call Today if you want the Best Poway Tree Service, the Best Rates, and a beautiful property with healthy, happy trees. Businesses around Poway have to keep their storefronts and properties looking neat, clean, and beautiful to match the surrounding landscape. We are a San Diego based Tree Service company that provides the highest quality work at affordable prices, we know that if you’re a Homeowners association, property manager, or business owner keeping costs down is important and you’ll most likely be required to get multiple bids on your commercial tree services in Poway. When you contact Estates Tree Service, we will provide a detailed and written tree service estimate, we believe in putting our clients needs first and we can work with your budget, job requirements, tenants and more to ensure that the job is completed to your satisfaction. We believe in building lasting relationships, our 100’s of repeat customers throughout San Diego County and Poway return to us because they know that we are professional, timely, and affordably priced. You can depend on Estates Tree Serice for your Poway Tree Service needs.